In a bow to marketplace realities, an American Bar Association commission unanimously recommended that lawyers be permitted to join as partners with professionals from other disciplines. The proposal represents a significant break with existing U.S. law and requires a revision of the ABA Model Rules of Professional Conduct. Before such a change could take effect in California, the Supreme Court would have to enact a new rule of professional conduct, a prospect which could take years. "These changes would allow clients more options in where they obtain legal services, and lawyers more choices in how they serve clients, but maintain the core values of the legal profession and the protections those values guarantee the public and clients," said Sherwin P. Simmons of Miami, chair of the ABA Commission on Multidisciplinary Practice. The commission's proposal would permit fee-sharing between lawyers and other owners of multidisciplinary practices, commonly known as MDPs. Legal ethics rules would apply to those practices, which would be subject to court regulation. 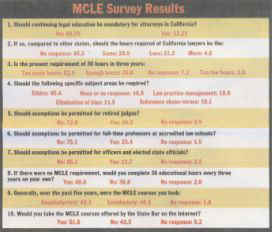 Two out of three California attorneys who responded to an informal Bar Journal survey believe continuing legal education should not be mandatory for the state's licensed attorneys. By a smaller margin, lawyers said they would take 36 hours of continuing education even if it were not required. Sixty-three percent consider the present requirement of 36 hours every three years to be too many hours. The vast majority of respondents oppose exemptions from the regulations, with the most opposition - 85 percent - directed at elected and appointed state officials. Forty-seven percent of the respondents left blank or answered "none" to a question on special requirements in ethics, bias, stress reduction and law practice management, but nearly the same percentage said they support an ethics requirement. More than two years after a California appellate court found the State Bar's MCLE program unconstitutional, the Supreme Court seemed receptive to arguments last month that the educational requirements should stand. The justices expressed misgivings about the content of some continuing education offerings and concerns about technicalities of the current exemptions, but appeared reluctant to "throw out the baby with the bathwater." Retired attorney Lew Warden, who lost his license in 1993 for failing to complete his MCLE requirement, argued that the program violates his "fundamental right" to practice and that the exemptions of five groups of attorneys violate the equal protection clause of the constitution. The exemptions - for retired judges, full-time law professors, legislators and elected state officers, and federal and state attorneys - were the basis for a First District Court of Appeal ruling in 1997 that the program is unconstitutional. There is no rational basis, the court said, for the exemptions. The State Bar has moved its San Francisco headquarters to 180 Howard St. The main telephone number is 415/538-2000. The Bar Journal's new number is 415/538-2504. A complete telephone guide appears on page 15.